No, we went to the polo. Yes polo. That's the one with the ponies - not that rather aggressive water sport. The sport of kings (or is that horse racing?) and very rich people who like nothing better than bringing half a dozen of their prized ponies to a big grassy area in SW London for a spot of exercise. Ham Polo Club was established in 1926 and, being located just 8 miles from Hyde Park Corner, is proud to be the only surviving London Polo Club from the 12 that existed in the metropolitan area. And for a fiver, every Sunday between May and September, you can pop along with your picnic, enjoy a relaxed afternoon with the ponies and listen to some of that fantastically droll yet witty commentary that the Brits do so well. 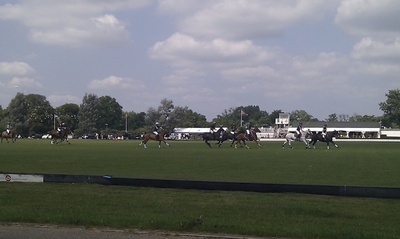 Ham Polo Club - for the rich and poor alike! Ham Polo Club prides itself on being a family-friendly club and being a family-friendly club means extending a warm welcome to the polo fold for visitors. Proceedings commenced with a casual 'hello' and 'welcome' to those of us in the spectators area (aka the grassy bit on the opposite side of the ground from the clubhouse) and throughout the afternoon, the various commentators periodically checked in to ensure that we picnic-ers were enjoying ourselves. They also asked for a bit of a wave or a cheer - mainly one said, to check that we weren't all in a wine-induced sleep. Cheeky! There are 4 chukkas per game of 7 minutes each - easy! 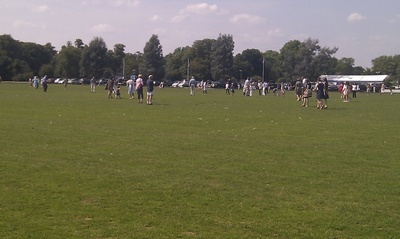 And in between games and at 'half-time' everyone is encouraged onto the ground for a spot of treading in (for those of you who've seen Julia Roberts whoop it up in Pretty Woman, they called it 'stomping the divots'). 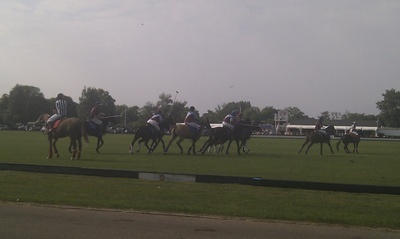 The teams change ends after each goal (not each chukka) - this is very confusing for beginners, both players and spectators. There's a bell that rings to signify the end of each chukka - but then play continues for another 30secs until another bell rings to signify the real end of the chukka. Hmmm - more confusion. 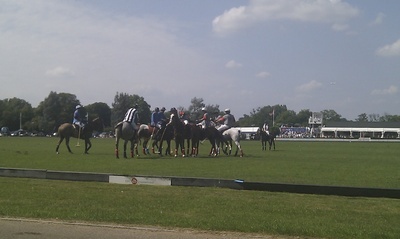 Each player changes their pony after each chukka. Ah easy - but wait. That means that each player needs 4 ponies per game - that's 16 ponies per team, 32 per game. No wonder they call this a rich man's sport. So on we went. 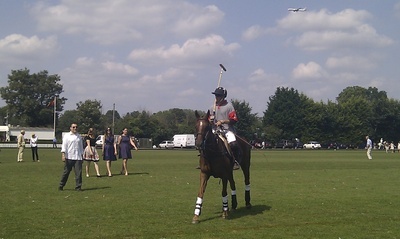 The ponies (not horses, they are ponies people) cantered about and the riders swung their polo sticks with the aim of getting the little white ball in between the two posts at their end of the field. Every so often, play stops and there's something like a throw in from the umpire. I didn't get across the rules enough to understand why this was happening (something to do with drinking wine in the sun I believe) but when there were a few on our side of the ground, I suddenly sat up, amazed. It's just like a Rugby scrum on horse-back! The Throw In - just like a rugby scrum on horse-back! All up we spent 4 hours picnic-ing, treading in and enjoying the atmosphere and spectacle of the whole polo thing - and let me tell you it's one of the best value fivers I've ever spent. There are still nine Sundays left of this year's season (not on August 13th though) and all are welcome. Getting there is pretty easy - the website gives driving directions and car parking is free once you've paid your £5 entry. The 65 and 371 buses run from Richmond station and stop right outside the club so you can enjoy your favourite tipple if that's more your thing. Quite frankly if you are a local, you should be ashamed if you haven't been yet. It's welcoming, great value and an opportunity to peek into a lifestyle for a few hours at least that most of us will never have the chance to experience. You may even spot a Royal. So pack your picnic and trot along for a fabulous afternoon.